If we happen to have visitors in the house at the children’s bedtime, they invariably get roped into reading a bedtime story. Some of my friends read with such character and drama that it is not exactly conducive to settling kids down, but it is a lot more exciting than my own reading of the same story. Equally, grandparents are a pushover and one story turns into ten. Some children, such as those living a great distance from extended family, may not have the opportunity to be read to by people other than their parents. Readeo can change that. 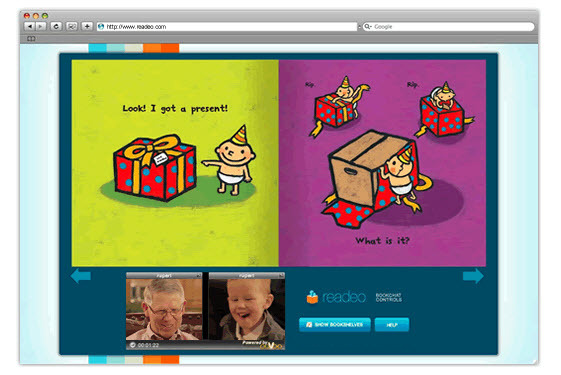 Readeo is an online program that connects two households through a website where they ‘virtually’ read books to each other – the designers call it ‘bookchatting’. You may think you can do much the same on Skype but Readeo lets you see and ‘turn’ the pages of the book while seeing and hearing the person that is reading. Once you have set up a Readeo account you link with people you know and then choose a book to read from the digital library. There are more than fifty titles available (suitable for children up to age eight) and more are being added constantly. The books available are both entertaining and educational and have been selected by an experienced children’s book reviewer. There’s something for everyone from ABC and counting books to stories about animals, the circus and monsters. There are lots of familiar characters, such as Maisy, and a good mix of classic and new books. Apart from being able to link with friends and family that live far away, Readeo would also be terrific for parents that have shift work or have to travel for work. Memberships are US$6.99 a month and only one household of the two participating has to be a member for things to work.